FREE 10 yards of 1.5" and 7/8" practice ribbon with every kit while quantities last! The Brilliant Bowmaker System lets you make bows easier, faster, and more beautifully perfect! Your learning curve goes from months to minutes! Make bows for your boutique, daughter, friends, gifts, curtain tiebacks, floral arrangements, scrapbooking, greeting cards or anywhere that could benefit from a Brilliant Bow! In minutes you can learn to be a Brilliant Bowmaker! Kit includes 7 plastic templates in Infant, Small, M, L, XL, 5", 6", and 7" sizes (makes bows 1.25" through 7"), spiral bound instruction and idea manual, bow stapler (optional assembly method) and refills. Surround loops are named for their curvy loops that will surround a smaller bow layered on top of it. Perfect for stacking, these versatile loops will enhance any Classic or Twisted boutique bow that it is paired with, giving dimension and eye catching flair. Surround Loops also work beautifully on their own, producing beautiful blooms like posies, sunflowers and poinsettias, and are also useful for making spirit pin medallions, and reusable gift bows. 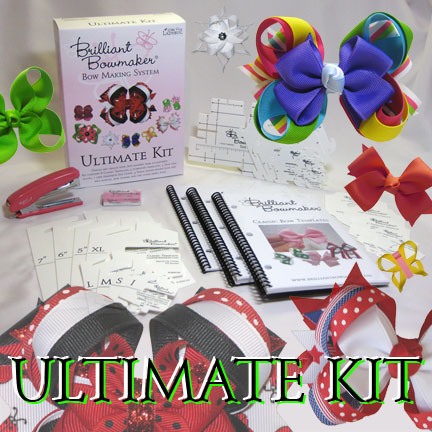 The kit includes the durable, patented Brilliant Bowmaker templates, instructional books, and more! The included books cover 7 techniques including the Basic fold, Stacking, Layering, Criss cross, Long tails, Cheer bows, Stacked with twists and Stacked with tags.